Imogen's Typewriter. 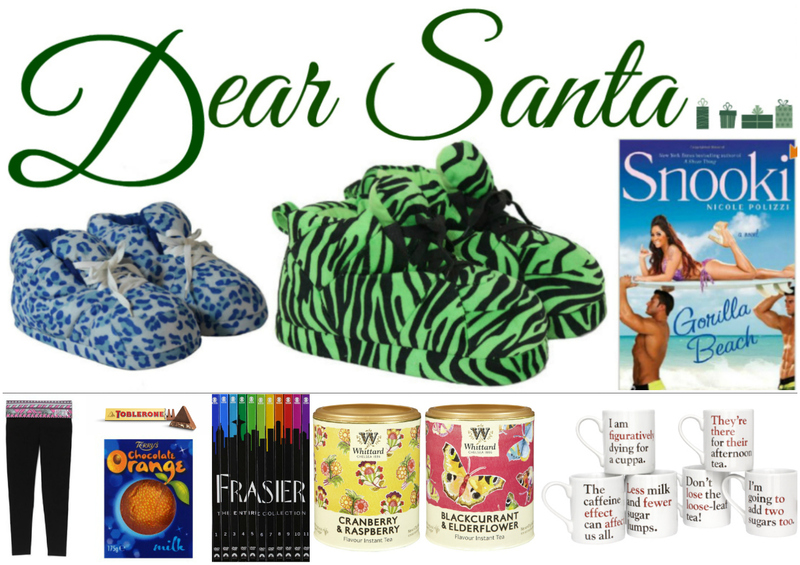 : Blogmas Day 1: My Christmas Wishlist! I always say I can talk myself out of buying anything, I've been known to talk myself out of buying anything from a 17p pack of gum up to a £500 plane ticket. I am the master of not buying things. So this list is everything I regret not buying over the last 12 months/ my Christmas Wishlist. Enjoy! Snooki Slippers! I love them. I love Snooki. These are the most comfortable slippers on the planet, they're like walking on clouds and I want them in all the colours. I have them in Leopard and Pink Leopard already and I just want more! And on the subject of Snooki; Gorilla Beach by Nicole Polizzi! I've read the first of her novels and it's actually really good and a great holiday read if you want something fun. Maybe it isn't literary genius, but that's overrated anyway. It's nice easy reading with good plotlines and developed characters and I've wanted to read the second one ever since. Victoria's Secret Yoga Pants! My gym wear tends to be oversized sweatpants, a teeshirt and a hoodie but I want to look a little more put together and I think these are the way to go. My friend Ashley swears by them and I trust her opinion completely. And since I'd be going to the gym- A Toblerone and a Terry's Chocolate Orange! Christmas chocolate classics! Everybody needs one of these in their stocking. The Frasier Boxset! I love this show! I have the season 1 boxset from forever ago and I watch it on the internet on and off again and it really is a great show. So I'd like to own the whole 11 season boxset. I tend to buy from iTunes but £230.89 for 11 seasons! Appalling. Especially when you can get it on Amazon for £49.99. Whittard Teas! I love them but I always forget to buy them when I'm near a store so this is more a reminder to myself to pick some up ASAP. Perfect for the cold months ahead we are predicted ahead. I could drink them out of these ever so slightly condescending Grammar Mugs. I'm not saying I'm the best at grammar, I make mistakes, but I feel I would make fewer mistakes with these mugs. Yep. I really like them. I literally need one. Okay I'm done. 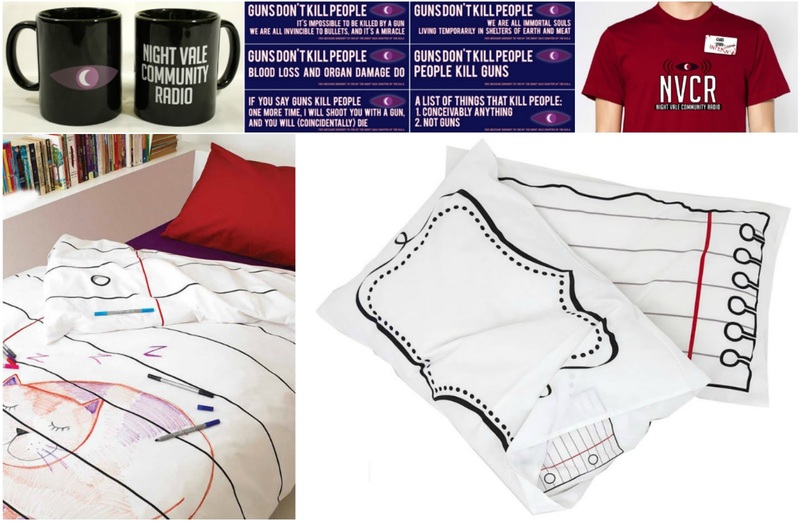 Speaking of mugs, this NightVale Mug and these NightVale Bumper Stickers are pretty awesome. Oh and this Intern shirt. I'm really loving Welcome to Night Vale lately. I'm redecorating my room at the moment just trying to make it a little more- me. And this Doodle Pillow Case and this Doodle Duvet Cover are just perfection. Who doesn't have brilliant ideas just as you fall asleep. Now all you have to do is scrawl it on your sheets and they wash out. Genius. Lastly! I swear this is the last thing and a bit of a pipe dream, Animal Crossing or the Pokémon Nintendo 3DSxl! I love Animal Crossing and Pokémon, and my old DS is really really battered and torn apart after having it for.. 5-6 years? Maybe longer. I tweeted about the poor battered thing back in July and it has lost even more of the plastic cover since to the point where I'm weary of being electrocuted! That ended up a lot longer than I meant it to be! What's on your wish list? I love tea too & Whittard have so many lovely ones to try. I have their Sleep Tea and really enjoy that one.